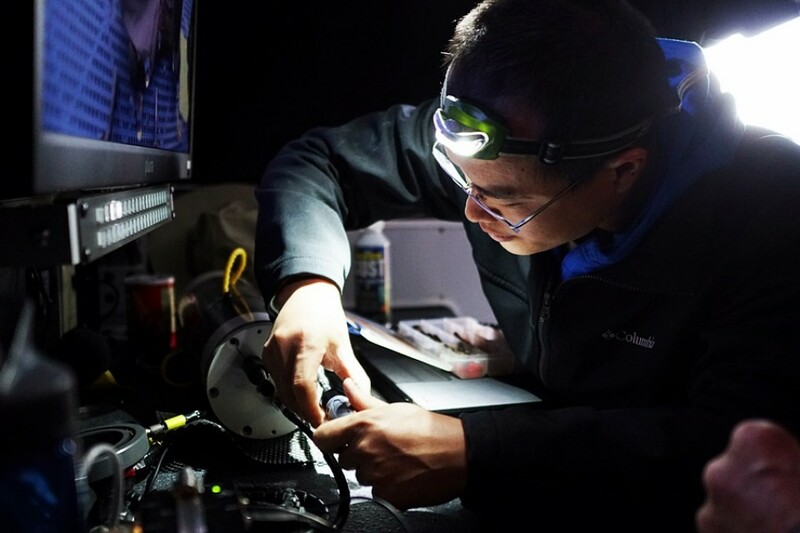 Bill Seyfried, Christie Cino, Chunyang Tan, and Peter Scheuermann from the University of Minnesota are using the Yogi Remote Operated Vehicle (ROV), to analyze the chemistry of the hydrothermal vents on the bottom of Yellowstone Lake. They will be doing this in three stages. 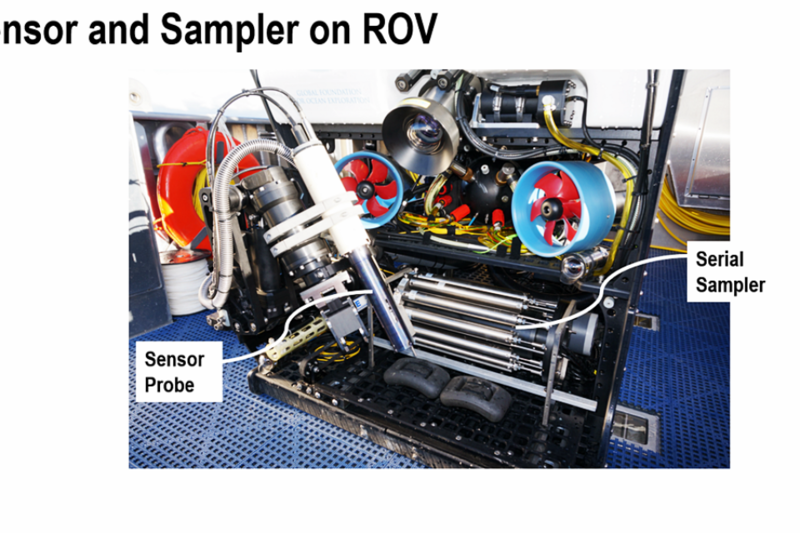 First, they collected fluid samples from previously selected hydrothermal vents. 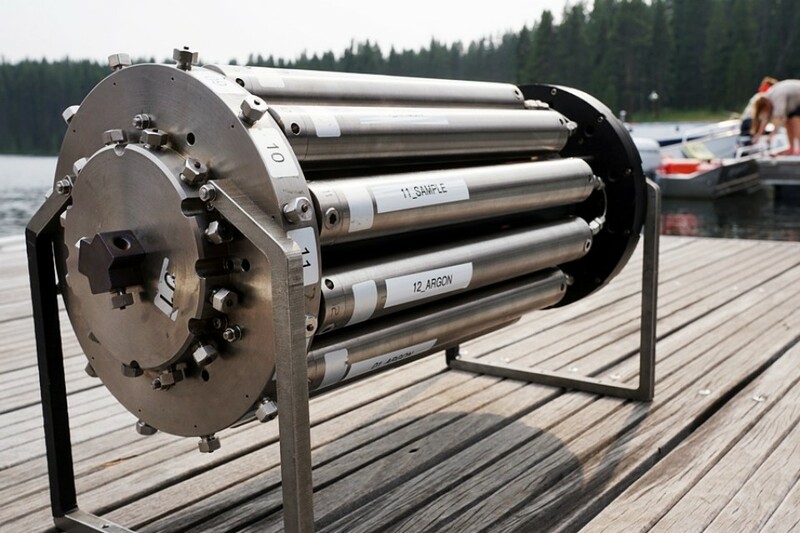 This was done using a specially designed sampler that keeps the collected fluid at the same pressure as the lake bottom, thus keeping dissolved gases from escaping. The gas escaping from hydrothermal fluids is similar to opening a soda bottle and the lowered pressure allowing bubbles of carbon dioxide to form and escape. Second, they partially excavated the vent to prepare for the deployment of chemical sensors that will be placed there for an entire year. 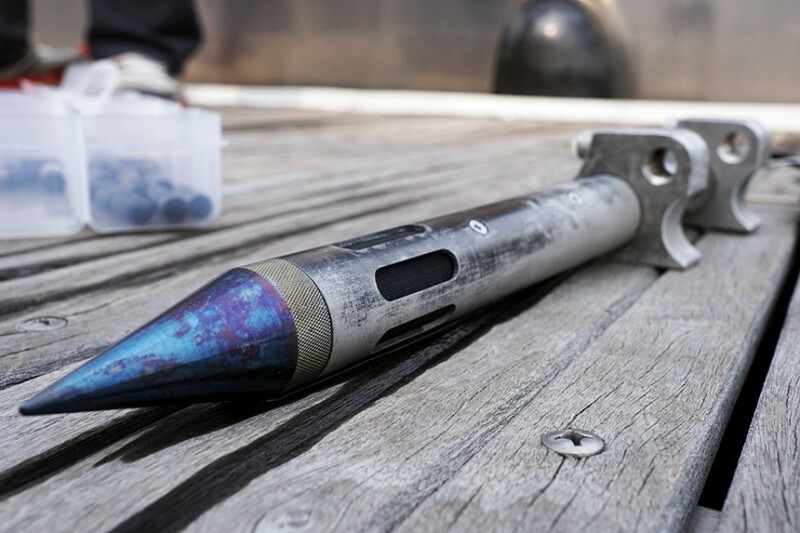 During this process, short sediment cores called “push cores” were taken in and around the active venting area. 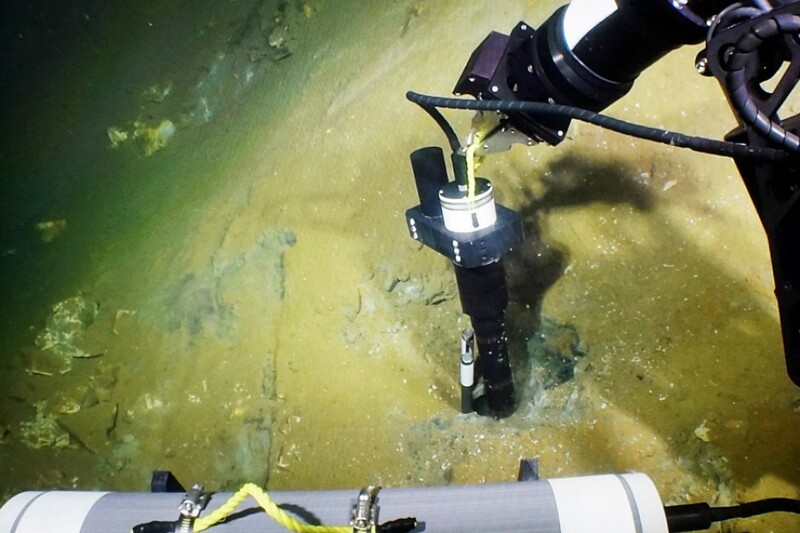 Bill Inskeep from the Montana State University will analyze the DNA of the microbes and how they adapt to different lake floor environments, while the University of Minnesota group will analyze the chemistry and minerals present. Lastly, a housing was placed over the vent to funnel the hydrothermal fluids and to hold the chemical sensor in place for an entire year. The placing of the sensor is very tricky because it must be balanced on the housing and if it rests too deeply, the high water temperature can negatively affect the electronics. Their work will help characterize the chemistry of the vents and how they are changing throughout the year. Story and photos by Louis Garcia, Louisiana State University. Work was completed under an authorized Yellowstone Research Permit. 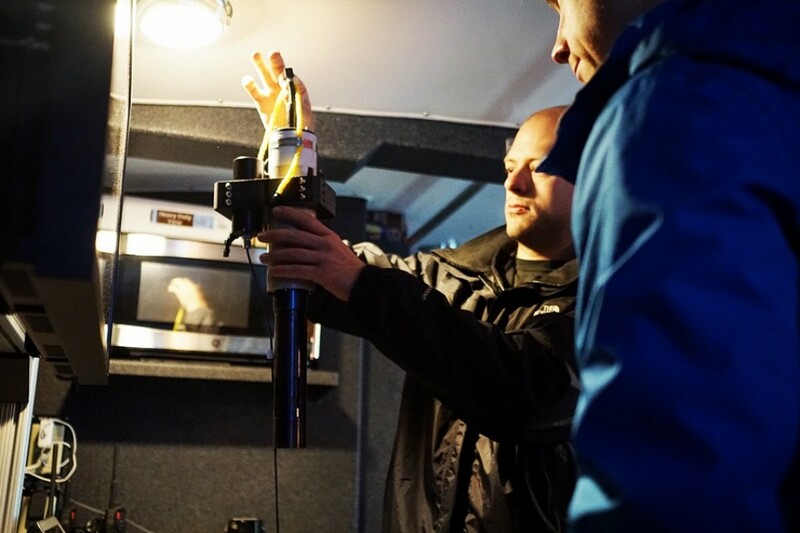 Peter Scheuermann testing if the battery for the chemical sensor will float or sink. If it was able to float, then it could displace the sensor from the housing. Work was completed under an authorized Yellowstone Research Permit. 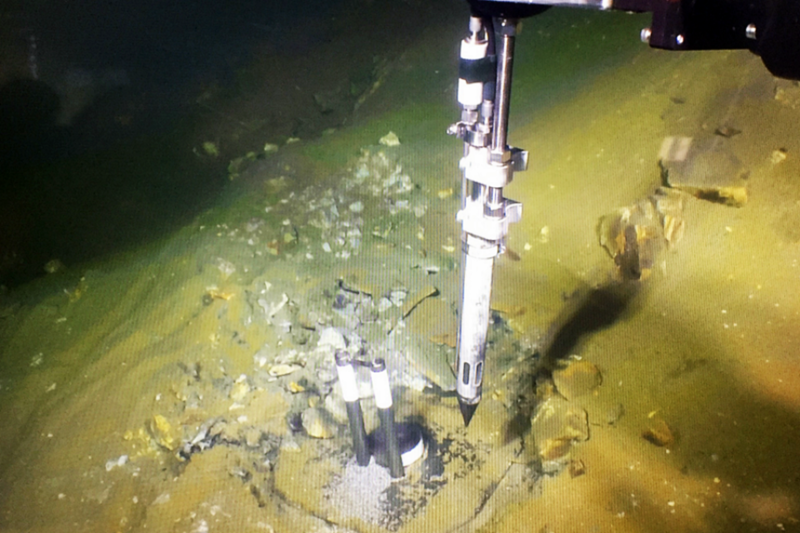 Close up of the probe that was used to extract fluids from various hydrothermal vents at the lake floor. Work was completed under an authorized Yellowstone Research Permit. Close up of the chambers of the “Serial Sampler” where the hydrothermal fluid samples will be stored at pressures equal to the lake bottom. The tubes labelled “ARGON” were filled with gas that was used pressurize the fluids and would not chemically react with samples. Work was completed under an authorized Yellowstone Research Permit. The “Serial Sampler” and chemical sensor mounted on YOGI. The multichamber storage of the Serial Sampler is located on the bottom tray and the sensor probe is attached to the arm on the left. (Photo Credit: Bill Seyfried – University of Minnesota). Work was completed under an authorized Yellowstone Research Permit. 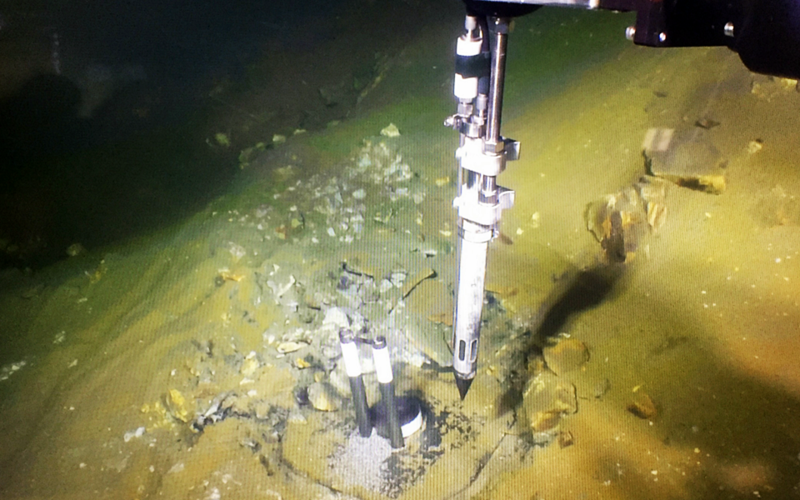 Screen shot of YOGI’s front camera of the serial sampler extracting hydrothermal fluid. The housing used to funnel the vent fluids can be seen at the bottom of the screen, to the left of the tip of the sampler. Work was completed under an authorized Yellowstone Research Permit. Engineer, Daniel Rogers, inspecting the chemical sensor before it is mounted on YOGI. Work was completed under an authorized Yellowstone Research Permit. Chuyang Tan preparing the battery for the chemical sensor before it is deployed to the lake floor. Work was completed under an authorized Yellowstone Research Permit. Screenshot of YOGI’s front camera as the chemical sensor is placed for a yearlong deployment. The battery can be seen in its cradle at the bottom of the image. Work was completed under an authorized Yellowstone Research Permit.